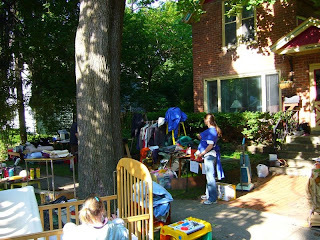 A week ago, the Faders and McLaughlins had a yard sale (not a garage sale, as the McLaughlin garage is not accessible from the street). Years of thrifty living have taught us the art of careful preservation, and so this yard sale required going against those long-honed impulses. I took to describing the process as "slash and burn yard saling" (in reference to a global farming method) because of the feeling of recklessness that I had to constantly fight. 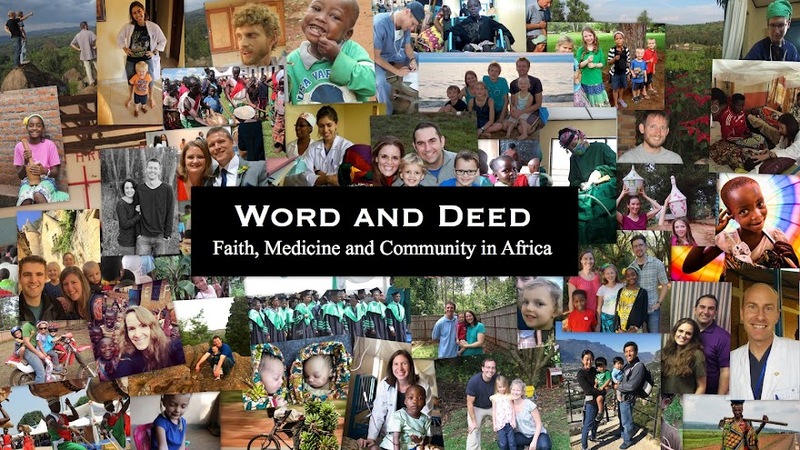 Nevertheless, the necessary thought process was clear: Are we taking this to Africa? No? Well, are we going to find a way to save it while we're in Africa? No? Do we really need it for the next few weeks, before we move out? No? OK, then how much should we price it for? And knowing that we are just going to take this all down to the Salvation Army in a few hours if it didn't sell made for very easy pricing. We picked up a little cash, and definitely got rid of a lot of stuff. Anna taught each and every passerby that "you can't buy anything without a price." We congratulated her on her acquisition of capitalist fundamentals, but reassured the sale visitors that even that rule was flexible today. Admittedly, it's hard to get a gift for a McCropder, what with their propensity for the rapid liquidation of all their property these days. 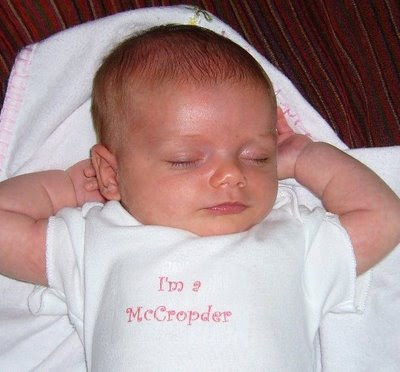 So, you may ask, what would one McCropder get another McCropder to honor the birth of a baby?